There are two substances that fall into the category of Fountain of Youth. They are Vitamin D and bioidentical DHEA. Both of these substances are made from cholesterol. Cholesterol is life giving and not the villain it has been made out to be. We now know that dietary cholesterol and high levels of cholesterol in the blood are not the cause of heart disease. Dr. Sandro has a great article on this topic. If you are searching for the Fountain of Youth, continue reading to learn more about Vitamin D and DHEA, which both come from the surprising source, cholesterol. Adequate levels of Vitamin D are important for bone strength, improved mood, physical performance, healthy immune function and even reduced rates of certain cancers. A deficiency of Vitamin D3 can result in obesity, diabetes, depression, fibromyalgia, chronic fatigue syndrome, autoimmune disease and diseases of aging including arthritis, Alzheimer’s disease and hypertension. Vitamin D is a steroid hormone made from cholesterol. When our skin is exposed to sunlight, cholesterol can be converted into Vitamin D3. Daily sunlight exposure is the best way to get Vitamin D3, but most people are not outside for 20 minutes every day with their skin exposed. Food sources of Vitamin D include egg yolk, fatty fish and beef liver. It is very difficult to obtain adequate Vitamin D3 from food sources alone. Vitamin D3 Supplementation is recommended. Usually 2,000 IU to 5,000 IU daily. It is best to also supplement with Vitamin K2 to prevent calcification of the arteries. Test - Once a year have a Vitamin D blood test and aim to be in the range of 50 - 80 ng/mL. The blood test you need is called 25(OH)D. An at-home test kit is available here. DHEA stands for Dehydroepiandrosterone – the medical world is rife with acronyms, now we know why! DHEA is a precursor hormone also synthesized from cholesterol, secreted by the adrenal glands and metabolized in the gonads and skin. When DHEA levels are low, the body will not have adequate hormone production. This imbalance can leave one feeling flabby, fatigued and stressed and susceptible to many diseases of aging. DHEA is the most abundant hormone precursor in the body. In men and women alike, DHEA peaks by age 25 then drops each year after at a rate of about 2% each year. The aging process is tied to a decrease in hormones like DHEA and growth hormone, and is tied to an increase in cortisol (the stress hormone). DHEA has a multitude of benefits backed by scientific studies. When DHEA is applied to the skin it is about 90% more active than when we take it as a pill. DHEA metabolism occurs in the skin naturally. DHEA is converted to other hormones like estrogen, testosterone and about 50 other hormones. DHEA is not addictive or habit forming, and is available over the counter without a prescription. DHEA has no dangerous side effects. DHEA is a Building Block for hormones, sebum, collagen, cartilage and more. Improvements in mood, libido, skin health and bone strength. Less anxiety and depression. The best anti-aging plan is a comprehensive approach. Eat a nutrient-dense diet, centered on unprocessed, whole foods with plenty of fresh vegetables and fruits. Hydrate properly. 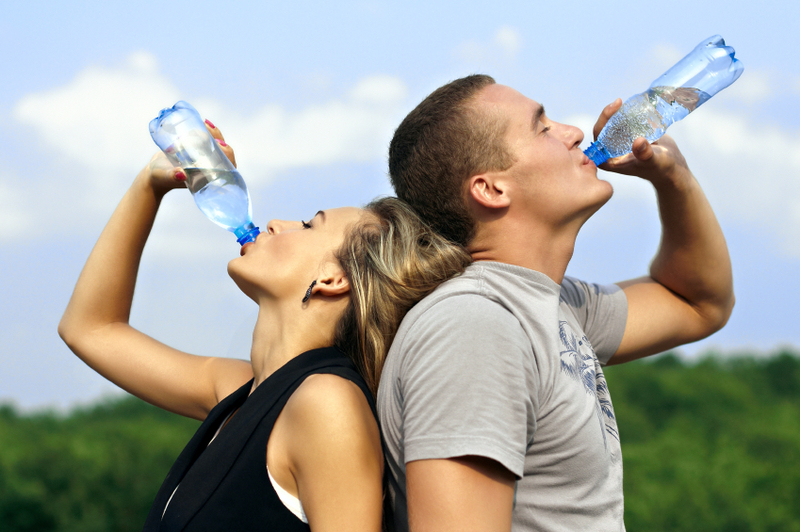 Drink filtered water; about half your body weight in ounces of water (for example, a person weighing 150 pounds needs approximately 75 ounces of water per day). Maintain healthy hormones. 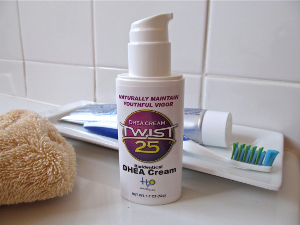 Twist 25 DHEA cream daily is a good start. Have your hormone levels tested. Supplement wisely, including Vitamin D3, Omega-3 fish oil, magnesium and Vitamin K2. (1) Brownstein, David. “DHEA to the Rescue.” Newsmax Health. NewsMax Media, 16 May, 2011. Web. 03 Aug. 2015. (2) Hossein-nezhad A, Holick MF. Vitamin D for Health: A Global Perspective. Mayo Clinic proceedings Mayo Clinic. 2013;88(7):720-755. doi:10.1016/j.mayocp.2013.05.011. (3) Labrie C.; Flamand M, Belanger A, Labrie F. High bioavailability of dehydroepiandrosterone administered percutaneously in the rat. J Endocrin 1996;150(Suppl):S107-S118. (4) Labrie F, Bélanger A, Bélanger P, Bérubé R, Martel C, Cusan L, Gomez J, Candas B, Chaussade V, Castiel I, Deloche C, Leclaire J. Metabolism of DHEA in postmenopausal women following percutaneous administration. J Steroid Biochem Mol Biol. 2007 Feb;103(2):178-88. Epub 2006 Nov 3. PubMed PMID: 17084625. (5) Naeem, Zahid. “Vitamin D Deficiency- An Ignored Epidemic.” International Journal of Health Sciences 4.1 (2010): V–VI. Print. (6) Penckofer S, Kouba J, Byrn M, Ferrans CE. Vitamin D and Depression: Where is all the Sunshine? Issues in mental health nursing. 2010;31(6):385-393. doi:10.3109/01612840903437657. (7) Stevenson S, Thornton J. Effect of estrogens on skin aging and the potential role of SERMs. Clinical Interventions in Aging. 2007;2(3):283-297. (8) “Vitamin D and Bone Health.” Osteoporosis Clinical Updates. National Osteoporosis Foundation, February 2012. Web. 03 Aug. 2015.